Not cheap, but cheaper than knee-replacement surgery. 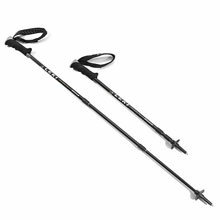 We&apos;ve recently been converted to hiking with poles. I love the sense of 4wd I get and it inspires me to keep barrelling up switchbacks without getting fatigued. The are almost impossible to use at the same time as an umbrella, but so far I&apos;ve been pretty happy with them. They are quite an investment, so you may want to borrow/rent a pair first to see if you like them. Petes Pole Page, has some good info on using poles including a little tutorial. Available from REI available for a whopping $199! This entry was posted in Backpacking, Gear Reviews on September 10, 2006 by brett. Someone should invent an umbrella attachment to thread onto the end of a trekking pole. Could either save the weight of the umbrella shaft or allow for a larger coverage area at the same weight.